A supercomputer developed by reclusive billionaire and software genius Harold Finch (Michael Emerson) analyzes data patterns in surveillance for the U.S. government to identify impending acts of terrorism. But the computer, known only as "The Machine," can also identify ordinary people who are about to be involved in violent crimes. Can those crimes be stopped before they take place? Secretly tapping into The Machine, Finch and ex-CIA a.. Victim or perpetrator, if your numbers up, we'll find you. The Machine identifies another gripping season's worth of potential crimes that must be stopped by billionaire tech genius Harold Finch (Michael Emerson) and ex-CIA operative John Reese (Jim Caviezel). Adversaries from Reese's undercover past and Finch's government work threaten the team's crime-fighting mission and anonymity. Meanwhile, NYPD Detectives Carter (Taraji P. Henson).. The Person of Interest team suffers a devastating loss and confronts staggering challenges in the hit series' most explosive season yet. Adapting to the evolution of The Machine, now completely self-governed and hidden from all, technical wizard Finch (Michael Emerson) and ex-CIA operative Reese (Jim Caviezel) team with rogue agent Sameen Shaw (Sarah Shahi) to save lives and seek justice. However, their missions now threaten to tear the.. The watchers are now targets: the malevolent artificial intelligence named Samaritan has come online, and with the full, secretive backing of the U.S. government, it is subtly surveilling and manipulating lives toward its diabolical purposes - and relentlessly hunting down the Person of Interest team. Reese (Jim Caviezel), Finch (Michael Emerson), Shaw (Sarah Shahi) and Root (Amy Acker) have so far escaped into new identities, but they .. 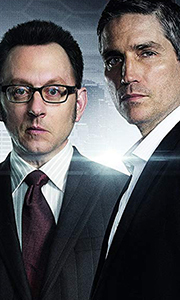 Season Four's near-destruction of The Machine left ex-CIA agent John Reese (Jim Caviezel) and billionaire tech genius Harold Finch (Michael Emerson) on the run with only a briefcase of source code. But The Machine's reboot brings up software glitches that put Reese and Finch, along with Detective Lionel Fusco (Kevin Chapman), ex-operative Sam Shaw (Sarah Shahi) and cyber-hacker Root (Amy Acker), on the front lines of the nation's survei.. The Person of Interest team suffers a devastating loss and confronts staggering challenges in the hit series' most explosive season yet. Adapting to the evolution of The Machine, now completely self-governed and hidden from all, technical wizard Finch (Michael Emerson) and ex-CIA operative John Reese (Jim Caviezel) team with rogue agent Sameen Shaw (Sarah Shahi) to save lives and seek justice. However, their missions now threaten to tea.. Although they’ve saved countless lives thanks to The Machine’s omniscience, Reese (Jim Caviezel) and Finch (Michael Emerson), along with lethal operative Shaw (Sarah Shahi) and unpredictable cyber-hacker Root (Amy Acker) now face an uncertain future in Season Four. With a second machine — Samaritan — now online, the elusive team now find themselves as targets, hiding in plain sight..
Own Person Of Interest Season 5 DVD from Deff, DVD, Blu-Ray & 4K Video Specialists - Free UK Delivery..